Orsinnar is a Clan-based society rooted in warfare. 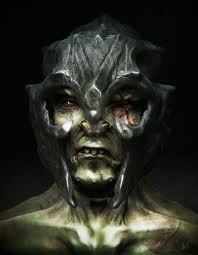 The culture of Orsinnar is based upon individual prowess and physical ability. The stronger an individual is and the more willing he is to assert himself, the higher his status in society will be. Orsinnar has a rich, deep culture that reaches back many, many centuries. 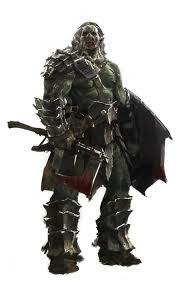 They are often described as "orcish" people with a noble sense of honor and duty to themselves and to their people. 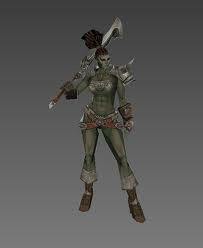 Orsien will never back down from their opponent once dedicated to the fight, and would die sooner than admitting defeat. Currently, the total population of the Orsinnar is unknown, but is estimated at a reduced 7,500 after the Great Kindred War. They are difficult to anger, but extremely brutal when war is finally decided amongst their people. The Manakahai Kindred has recently put an end to the fighting, and is now enjoying a short and relatively turbulent period of peace amongst the Clans. The Kindred traces its roots back hundreds of years to the Early Kindred War, in which the first original Kindred split. Ruthok Banecaller was the first High Kindred Chieftain of the Manakahai, and he took the position because of his role as the most prestigious Clan Chieftain from the allied Manakahai Clans. In the Early Kindred War, the conflict was mostly centered over who would have control over the central Orsien hunting grounds. The other High Kindred Chieftains fought brutally over this for years, resulting in hundreds of thousands of deaths, while Ruthok Banecaller and the Manakahai Kindred eventually withdrew to establish their own hunting grounds. Seeing weakness in the Manakahai Kindred, another larger Kindred decided to attack them. Not only did the Manakahai defend themselves, but under Banecaller's command, they crushed the other Kindred that threatened them and proceeded to claim their land and assimilate their survivors. Manakahai now became a more formidable and established power amongst the Kindreds, and did not enter another Kindred War again for another three hundred years. At this time, the Kindreds again clashed and the Manakahai Kindred was brought into another all-out war. The Manakahai Kindred had still been ruled under the Bane Clan, despite other Clans' attempts to challenge them, and when a young warrior from another Kindred challenged the Manakahai's High Kindred Chieftain and won, the Clans of Manakahai were enraged. They again went to war, overthrowing the new leader and placing yet another Bane Clan warrior in his place. A dissent amongst the people began at this time, when they believed that a leader from a different Clan should be established as the new High Kindred Chieftain because of the corruption within the Bane Clan. It was at this time that Kurath Redhawk challenged the High Kindred Chieftain, and took the leadership of the Manakahai. Much of the once-powerful Bane Clan furiously left the entire Kindred in a dishonorable display of unlawful Kindred realignment, allying themselves with a hostile Kindred that agreed to attack the Manakahai. Although most other Kindreds saw this as extremely dishonorable on the part of the Bane Clan and their new Kindred, the Manakahai received little support in the Kindred war that followed. Still, the Manakahai faced the other Kindreds. In the Great Kindred War that decimated most of the Orsien population, Kurath and his forces won a Pyrrhic victory through extended skirmishes and warfare approximately ten years prior to the present. The other Kindreds either disbanded into chaotic disarray or were assimilated into the Manakahai as subservient to the dominant Kindred. Currently, Kurath still leads the Manakahai Orsien, and they have seen an era of growth and prosperity after the Great Kindred War. Shortly after Kurath defeated the previous Clan-Chief of the Hawk Clan and took his position, he was thrust into the role of High Kindred Chieftain to defend his people from other Kindreds that threatened to destroy all of his Clans. The fighting took a great toll, but Kurath refused to back down from his enemies, even in the face of certain defeat. After years of brutal warfare that claimed thousands of his people, including much of his close family and his most promising young Champion, Kurath consented to his peoples' urging to leave their homeland. Kurath has many traits common to an Orsien Chieftain, most notably being his strength, courage, pride, and unshakeable honor. His weapon of choice is a spear or polearm, and he is a formidable opponent. Even though he has only held the position of High Chieftain for four years, he is marked with the deep scars of the many fights he faced to attain his position and keep it. He prefers action to words, and would just as soon fight as he would reason with another nation, although diplomacy is often his first resort. The violent and hot-tempered War-Chief Goruk is bitter and resentful, as most War-Chiefs are. A hammer or axe through the skull is just as good as a peace treaty to him, and as such, he is mostly kept away from matters that don't involve direct confrontation. Goruk is amongst Orsinnar's strongest fighters, and he is just as adept at leading massive Orsien armies to victory as he is at decimating any who dare to challenge his position. Thane Orioth is one of the wisest elders still surviving. His word is highly respected by his people, especially High Chieftain Kurath. Because he is old and wavering in strength, many suspect that a young challenger will come soon to usurp his position. Still, Orioth is loved by his people and he has been trusted within the Kindred Council's highest ranks for decades. Chosen from the ranks of Kurath's Clan warriors, Thorokai is extremely loyal and dedicated to Kurath and his cause. He is young and has a fiery spirit tempered by his desire to protect Kurath's life at all costs. He has never failed his High Chieftain, and he never plans to. He is often at Kurath's side, enacting his orders faithfully and standing proudly alongside his leader. Thorokai is fond of heavy armor and longswords to complete his duties as Kurath's Champion. War-Chief Goruk chose the most brutal, hideous, ferocious Orsien warrior he could find to fill the role of his Champion. Orgoth lives to fight and serve the bloodlust of war, and although he is vicious in combat, he's often ridiculed as the least intelligent Orsien Champion. He protects Goruk and intimidates any who might challenge him, and his mere presence is often enough to send adversaries skittering away. Built like a tank, Orgoth will use any weapons at his disposal, although he prefers warhammers - or even his bare hands - to tear enemies apart. 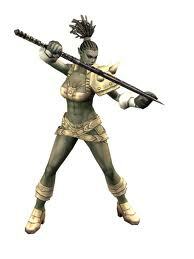 Okhennei is the eldest daughter of the former High Kindred Chieftain, who was killed and succeeded by Kurath. When her father was bested in combat, young Okhennei's life was also at risk since it is customary to also challenge direct descendants of the defeated ruler, in order to avoid corruption or plots to overthrow the successor. Okhennei accepted Kurath's challenge, and they planned to fight to the death. Orioth saw great potential in the young girl and named her his Champion, thereby cancelling the challenge and restoring her position. Her position is still contested, and there are constant attempts to overthrow her somewhat questionable role as Thane Orioth's Champion. 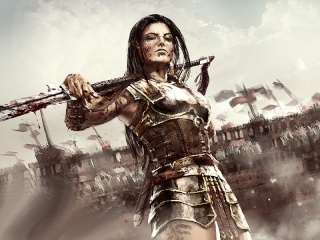 Her motives are sometimes questionable, but her skill as a fighter and her willingness to do the Thane's bidding have secured her position for now. Orsien are clearly different than most other races, and they have several main factors that contribute to their "orcish" appearance. There are some major aspects of common Orsien physiology that differ. Most notably, Orsien are typically much larger than other races, at an average of 6.5 to 7.5 tall and 200 to 300 pounds for men, and 6 to 7 feet tall and 150 to 250 pounds for women. 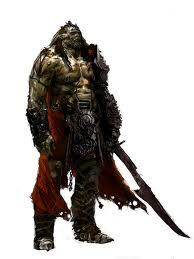 Their brutish appearance gives them the most menacing physical presence amongst the races of Aerrath. It is also common for Orsien to have grey or greenish pigmentation in their skin, although this is natural and it can range from almost unnoticeable to dusky grey or dark green. 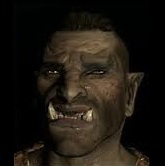 Many orcs, especially men but sometimes women, also have naturally extended teeth, usually lower incisors, that resemble tusks or fangs. The lifespan of most Orsien is similar to the average human lifespan, but young Orsien mature much more quickly. At the age of 10 to 13, most Orsien become physically mature. 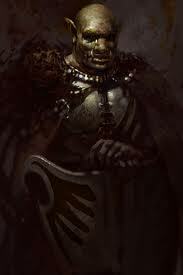 At 20 to 30 years an Orsien is in his prime, at 40 to 50 years considered middle-aged, and by 60 years, seen as elderly. Very few live past 70 to 80 years of age even in generally peaceful conditions. In relation, a warrior who reaches about 40 to 50 years has "lived a good life" and is expected to either by killed by a challenger or seek his death honorably in battle. This short lifespan is natural to the Orsien, but it is also decreased because of their warlike nature and high mortality rate. Orcs are extremely powerful and, pound-for-pound, they are amongst the strongest creatures in terms of musculature and physical ability. They have naturally strong bodies enhanced by years of hard labor, combat training, warfare, and the constant need to stay in their fittest condition in order to survive. 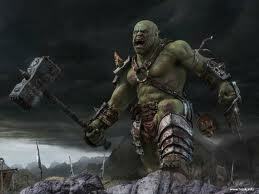 Overall, orcs are a healthy species relatively free from most hereditary issues and contagious diseases. With a thick skin and strong physical structure, they are not as susceptible to most physical damage as other races. They are sometimes prone to diseases borne by humans and elves, as they are genetically closer relatives to these races than dwarves or Drakin. They are resistant to heat and cold because of their nomadic lifestyle in which they must live in a variety of harsh conditions. However, orcs lack a strong genetic resistance to magic-based attacks, since magic is virtually non-existant in their society, and it is roughly as effective against them as it is against other non-magical races. The highest social rank any individual can achieve in all of Orsinnar is the High Kindred Chieftain. The High Chieftain is chosen from all of the Kindreds, and is the highest authority amongst all of the clans, regardless of other policies. Below him is the War-Chief, who directly leads Kindred warriors and is almost always considered to be the physically strongest warrior of the Orsien as he has worked his way up through sheer force. Next stands the Kindred Thane, chosen directly through ritual and wisdom, who acts as an advisor and general. A Champion also makes up the highest of the ruling Kindred social ranks as a highly acclaimed warrior and personal bodyguard of the High Chieftain, War-Chief, and the Thane. 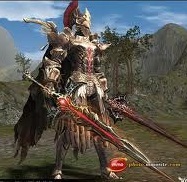 Other social classes based in career roles consist of warriors, hunters, crafters, and traders, respectively. Most of these roles are reserved for men, although women with the ability to prove themselves are usually not restricted. Women often tend to their villages, homes, and children while men take the more combative responsibilities. Orsien who do not apply themselves to a specific function are looked down on in society, as the well-being of the Clans are solely the responsibility of their members. Social classes affect wealth only in the higher ranks, and most common Orsien share similar status and access to resources regardless of their role because of the nearly communal nature of Clan society. Life in the nation of Orsinnar is based around an individual's Clan and Kindred. The Clan's role in everyday life is similar to a state government, whereas the Kindred is more like a national government. An individual's heritage is only meaningful based on his or her Ok'Shuuln, or Kindred. Society is divided up amongst Kindreds, which are large subcultural-national groups, and Clans, which are groups that often consist of extended families or cultural and social groups. Kindreds usually number in the hundreds of thousands, while Clans may consist of about one hundred to one thousand members. While it is rare for an individual to leave his "birth Kindred" or even associate with other Orsien outside of his Kindred, mobility between Clans is frequent and often occurs as a result of social ideology, family ties, marital status, and warfare. However, Clans interact with each other regularly, and any fighting amongst them is almost always natural in-fighting for dominance or position. These disputes are seen as amicable, rarely last more than a few months, and are a societal function to resolve disputes and matters of leadership in a more timely manner without lasting damage to any Clan or grudges amongst groups. Wars between Kindreds, on the other hand, are violent and brutal - they happen less often, but this type of full warfare can last for years and is more similar to merciless civil wars than the skirmishes between Clans. Whereas personal accomplishments are highly revered, lineage or family status is often only considered as a last resort except in matters of Kindred warfare. An individual is free to pass between Clans as he sees fit, providing that he can prove himself to gain access and membership into a new Clan, although loyalty and oaths to a single Clan are encouraged. Clans shift and change frequently. 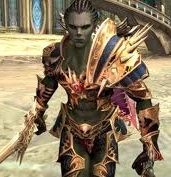 The most common way of creating a new Clan is when a young Orsien male takes his first wife or wives and leaves his previous Clan to begin a new family, often taking some relatives with him. 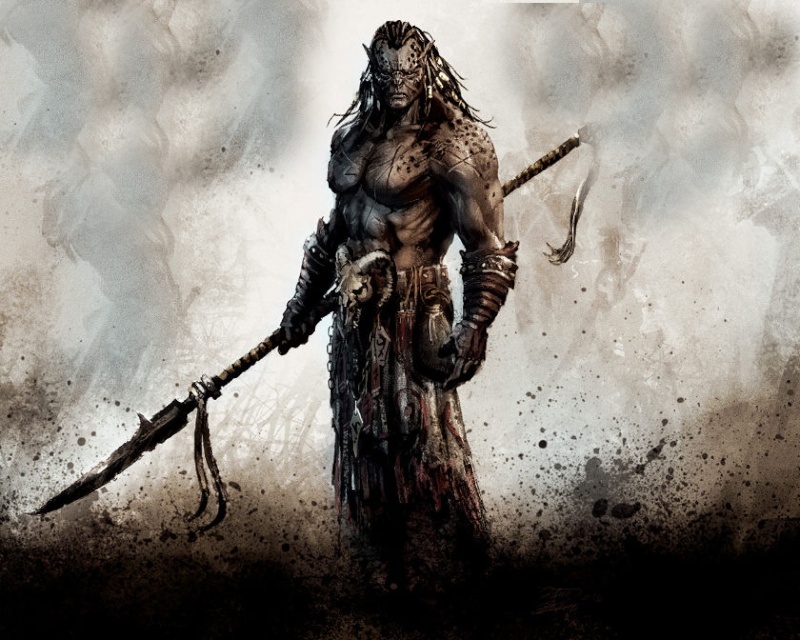 Often, a young Orsien warrior will challenge his Clan-Chief to a fight for the Clan's rule, often to the death. The dissolution of Clans occurs mostly through political merging of Clans or a disbanding due to lack of resources or mutual interest; warfare is very rarely the case, except in Kindred warfare, which often sees the destruction of many small Clans. 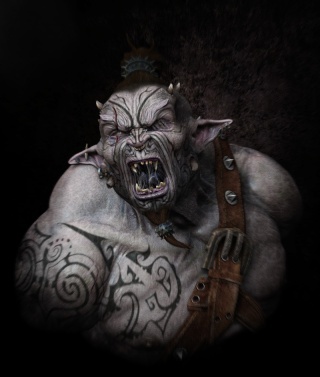 Orsien live in family groups or bands within their own Clan, many of which are nomadic and communal in nature. A village may consist of one to twenty households on average, all of which usually share their resources and cooperate together to ensure the survival and success of their families. Within a village, there are always groups of warriors and hunters to protect and provide. Homes are made of wood and stretched hides, and reinforced with carved stone and steel. Each village usually has one permanent central longhouse that serves as the Chief's hut and community building, as well as homes for each family which can easily be dismantled and moved. Some villages are enclosed with wooden barricades and have some land set aside for wheat and rice, and more permanent settlements have walls and permanent crop rotations. Hunting is a central part of Orsien society, as it is the main means of sustenance for society. 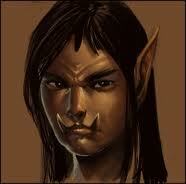 The Orsien people have a strict moral code against farming animals and most forms of agriculture. This stems from the belief that all creatures should be given the chance to escape from the hunt, and should an animal survive a hunt, its life will be spared. This "survival of the fittest" mindset is deeply rooted in Orsien culture, and prohibits the farming of game. Simple crops are farmed, but it is expected that a band's hunters are responsible for providing the majority of food. Because of this, the diet of Orsinnar consists mostly of large game such as boar, deer, and horse meat. Some animals, such as wolves and hawks, are strictly forbidden to be hunted, harmed, or consumed. In Orsinnar homelands, it is not uncommon that hundreds or even thousands of acres of land are reserved solely to allow populations of wild animals to be established so they have a natural chance of evading hunters. Any hunter who takes the life of an animal without properly allowing it a chance is subject to exile.